Welcome to my new blog story. A trip to the UK to catch up with all my friends and family that live here and to get a couple of rides in on the bike. Pommy Pete has said that the riding here is better than home so I am out to see if that's true. After a long and tiring flight I have meetings it to London. 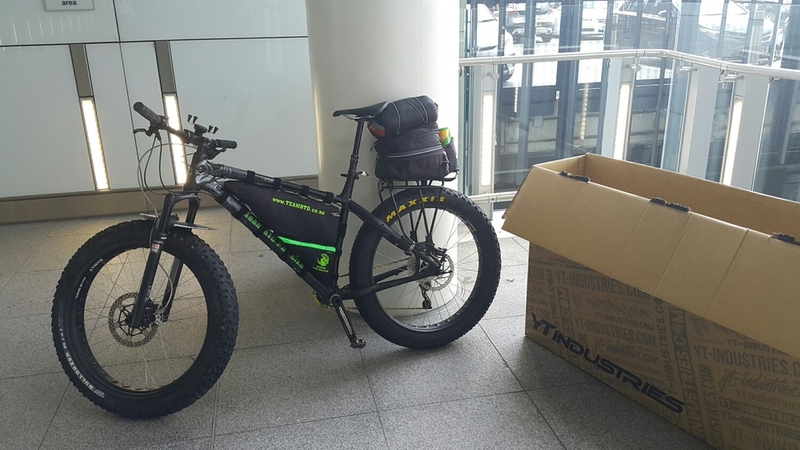 I assembled the bike at the airport and after having to catch a bus to get out of the airport itself hit the road. All loaded and ready to go. I fired up my phone to get the maps working for the journey to Bens place, to find that it was not logged into the local Vodafone networks yet. I set about the trip to Bens with a general idea on direction and off I went. I ended up getting help with directions from a kind man doing his garden, 2 different service stations, a pub where i had a pint, a dude on the street with a smart phone and finally a Vodafone shop. Turns out that as I switched the phone on again, at the shop, the network had kicked in and I was able to use my own maps to finish the journey. Not sure on the exact distance, but about 40-50k. Took me about 3 and 1/2 hours so not to bad. I arrived at Bens bang on 5.00pm just as he arrived home from work. Bens work wagon and a fat bike. We headed off down the pub for a couple of pints till Christina came home from work. Amanda and I gave Christina a greenstone as a welcome to the family. Ben looking fit and healthy. Before I left, I had contacted G3 (gary × all doors) and he popped in for beer after his work day was done. We had a good catch up and sorted to get together tomorrow night for a gathering and a curry. I headed of to Gregs place after this for a catch up with him and then of catch up on some missing sleep. Well, that's the end of a long 2 days, so see you all tomorrow.